Get up to 90% off on your purchase! IDrive, formerly known as IBackup, is an automated cloud backup cross-platform application that dates back to 1995, when it was created by Pro Softnet Corporation as one of the very first services in the online backup field. 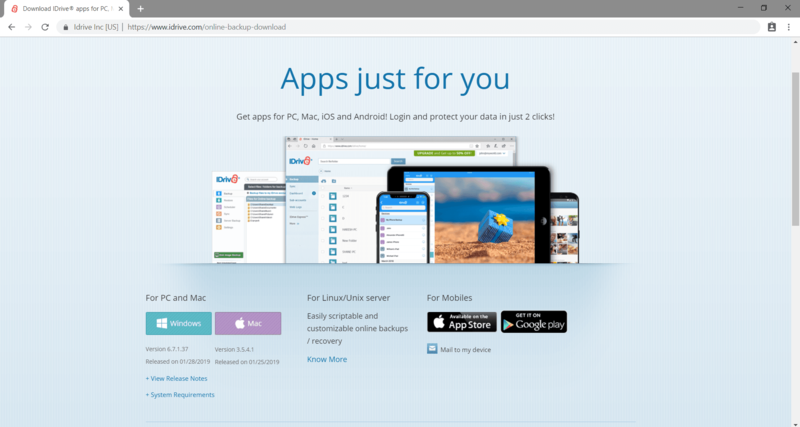 Sure, it is pretty old, but if anything, the old age of the application should give you some ever-wanted peace of mind as it has outlived many apps in the backup game and proved capable of overcoming the highs and lows of the industry, making it one of the best online backup providers out there. What’s appealing about IDrive is that it checks all the boxes when it comes to standard features that most users need, all without making a hole in your wallet. Unlimited devices? Check. Extensive sync capabilities? Check. Ample storage limit? Check. Affordable price? Check, check, and check! The convenience of IDrive allows it to be an ideal option for most users, one that’ll keep you in your comfort zone when it comes to safe online backups. If you’re a computer user with not-so-massive storage needs looking for a balance between features and price, IDrive might just be what you need. 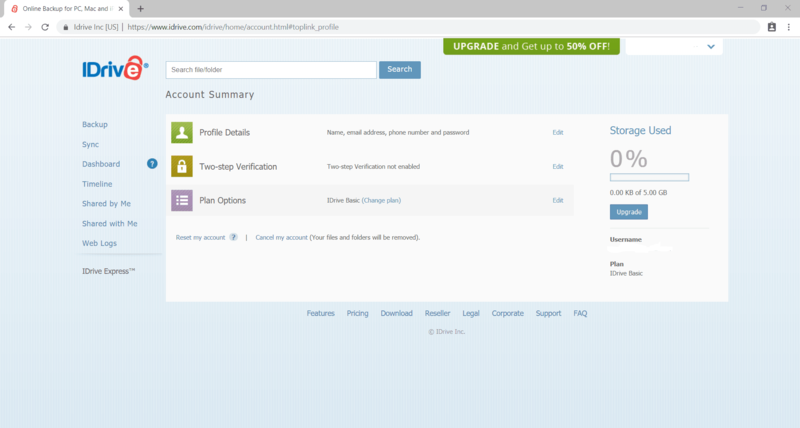 Well, read along as we review IDrive and prove that it’s worth signing up for the 5GB trial account for a test drive. 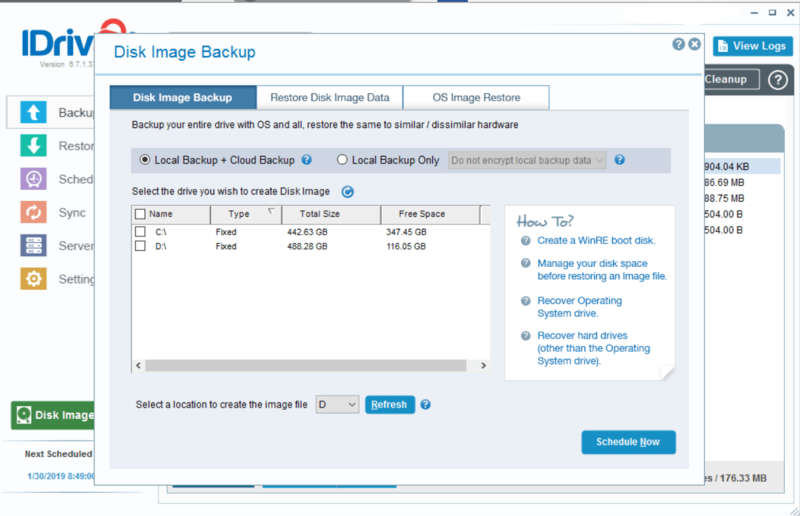 What Is the Difference Between Backup and Sync Services? Final Thoughts: Does IDrive Live Up to the Expectations? Online sync services, such as Google Drive, Dropbox, and OneDrive, are designed to help you sync your files across all your devices and share them with colleagues, friends, or family members. Online backup solutions, on the other hand, give you the bang for your buck, providing you with the ability to save your files on the cloud for them to be securely stored in the unfortunate event of your computer, smartphone, or tablet getting stolen or broken. If you have thousands of files, images, videos, and music that you cannot imagine life without, an online backup solution is what you need. Keep in mind that backup solutions don’t include system files and installed applications, meaning that you need to save any license key for your software elsewhere so you can re-install your apps whenever you need to do so. IDrive is truly a feature-packed service. 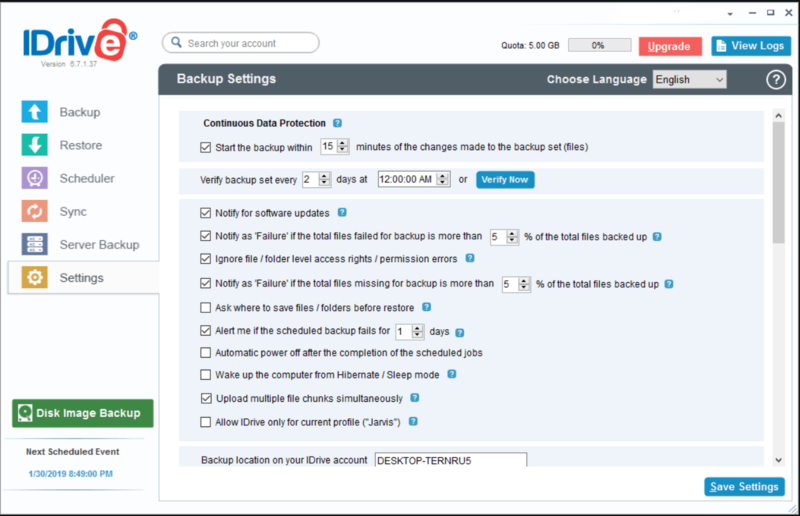 It has virtually every “nice to have” feature that anyone would need in a backup solution provider, along with some extra options that add to the convenience, thus providing the best balance of features and value for owners of multiple computers who don’t have massive storage needs. First, IDrive supports all major desktop operating system; Windows, Mac, and Linux, along with Android and iOS. What gives IDrive the edge over other backup solution providers is the fact that the mobile apps can be used to backup phone data, including media, contacts, and calendar events, not only access computer files that you’ve backed up. Furthermore, if you install the IDrive app on your Android or iOS smartphone, you can even back up call logs, app data, and Instagram and Facebook account, basically making the switch between phones a breeze. 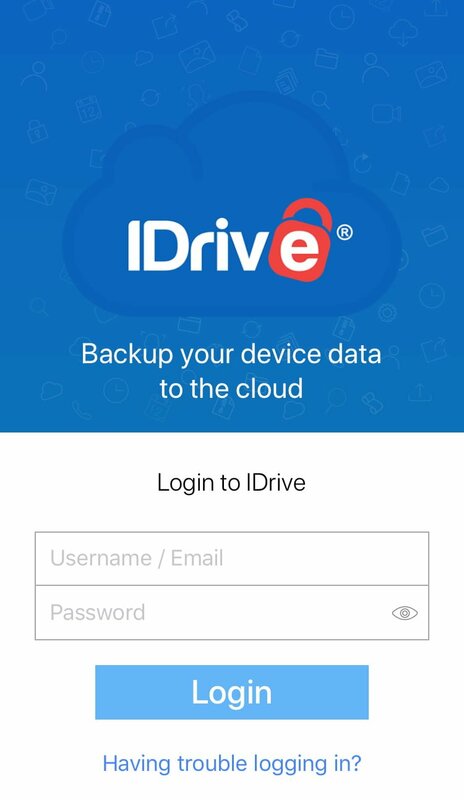 Unlike other services in the same category, IDrive’s features don’t stop at data backup and restoration, as it also offers synchronization and file-sharing options, both of which are more commonly associated with cloud storage solutions such as iCloud and GDrive, thus giving you the best of both worlds. 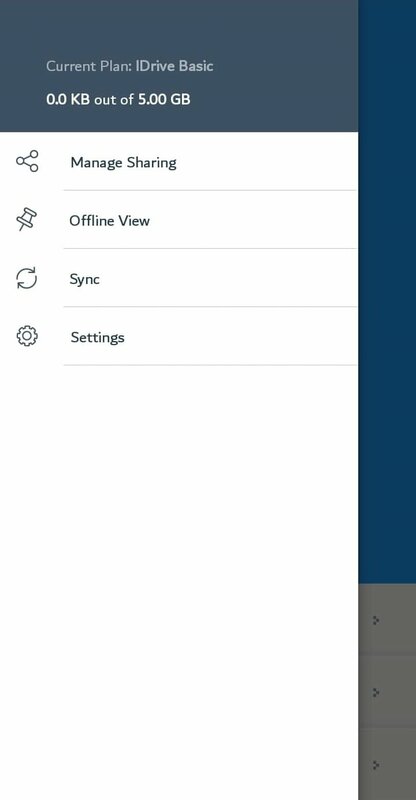 The synchronization option works by installing a sync folder in your file system, which you can use to tie all of your devices together, something that Dropbox has been doing for years. You can also access all your files and check your sharing status for each one of them through IDrive’s web UI, through which you can also access the content that other IDrive users have shared with you. We’ll talk more about the UI of IDrive later in the article. After downloading and installing IDrive on your computer, you’ll be prompted to select the folders that you want to back up by ticking the checkbox next to the folder or file name. Your desktop, music, pictures, videos and documents folders will be tagged automatically, but you can untick them if you wish. 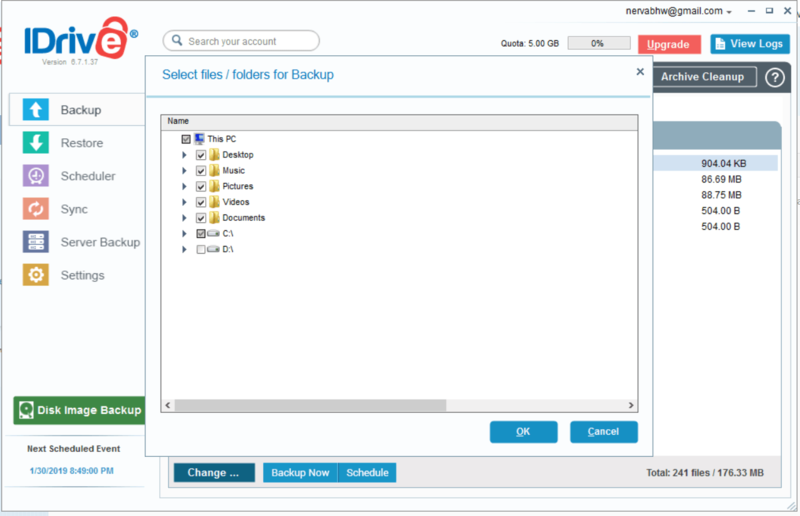 After selecting your folders, you can either start the backup process immediately by clicking on the “Backup Now” button or schedule it for later by clicking on “Schedule.” If you choose the latter option, you’ll get a set of settings that you can change. You can choose to run the backup at night, an option that would spare you days or even weeks of an online backup service monopolizing your connection and bandwidth while you’re working, pick a cut-off time for it to stop running, and select which days it should run on. The customization options are broad enough to fit any preference and schedule. In the settings tab, there’s a checkbox for “Continuous Data Protection,” which is a feature that uses block-level file copying to back up your files whenever a change is made to them rather than waiting for the scheduled backup time. Block-level file copying works on reducing the drain on system resources and speeding up the backup process by uploading only the modified parts of the file rather than the entire file. It also reduces the space required for versioning, which lets you restore previous versions of specific files in case you need to undo a change or recover from a ransomware attack. IDrive saves up to 10 versions of every file you’ve stored to keep you safe all the time. Furthermore, you don’t have to back up your files to the cloud every time, as IDrive gives you the option to make local backups in partitions on your hard drive, NAS devices, attached external drives, and WiFi devices. In case you are paranoid about hard-disk crashes, you can back up entire drives by creating a disk image then uploading them to the cloud, which may come in handy if your operating system doesn’t start up. To restore your files, head to the “Restore” tab of the desktop client, where you can restore either everything or just specific files. You can also choose whether to restore the files to their original location or a new one. 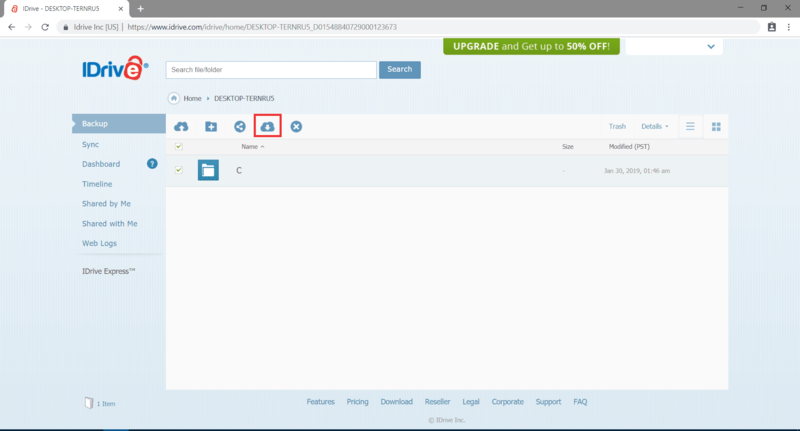 File restores can also be done through the IDrive web UI, which can come in handy if you’re trying to access specific files from a new computer. As mentioned above, IDrive offers an Android and an iOS app, both of which are pretty robust and reliable. Both Android and iOS apps are also quite modern-looking, and they’re blazing fast when it comes to operation. At least that was the case when using them on our devices. The IDrive mobile app offers previews of your files before you download them, and you can get sharing links for your files right through your smartphone. Besides its set of basic yet essential features, IDrive offers extra features for extra convenience. 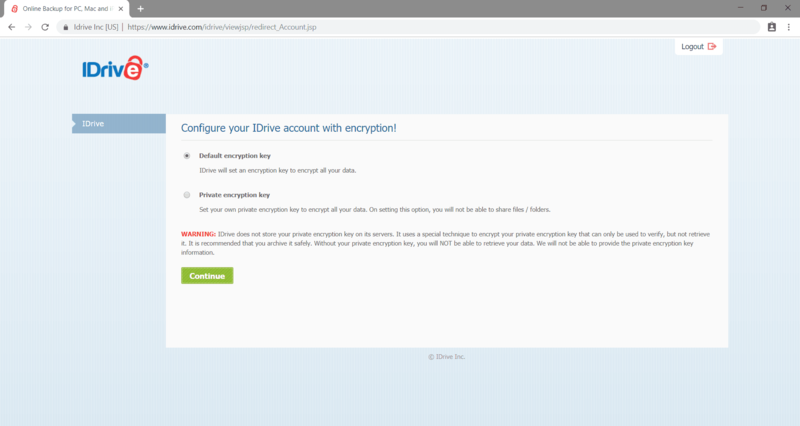 For security, IDrive gives its users the ability to use a private encryption key instead of the default encryption, which makes your data more secure. Should a user lose his or her encryption key, the encrypted files become inaccessible and useless for both the service and the user. If you decide to go with Private Key encryption, make sure to store your key in several secure locations to ensure that your data will be accessible for you forever. Not only that, but IDrive also offers email-based two-factor authentication (2FA) for all users, which should add some peace of mind to the equation. IDrive offers a service called IDrive Express courier, through which you can request a physical hard drive with a capacity that can get up to 3 TB once per year so you can perform your initial backup or restore your files locally when needed. Once the company receives the physical drive, it will upload your files to the cloud to save them there. If you have a substantial initial set of files to back up, not only will IDrive Express spare you having to suffer from a weak internet connection for weeks as IDrive backs up all of your files, but you’ll also get to do it quickly as copying is way faster than uploading, which can take weeks if you have a lot of data. 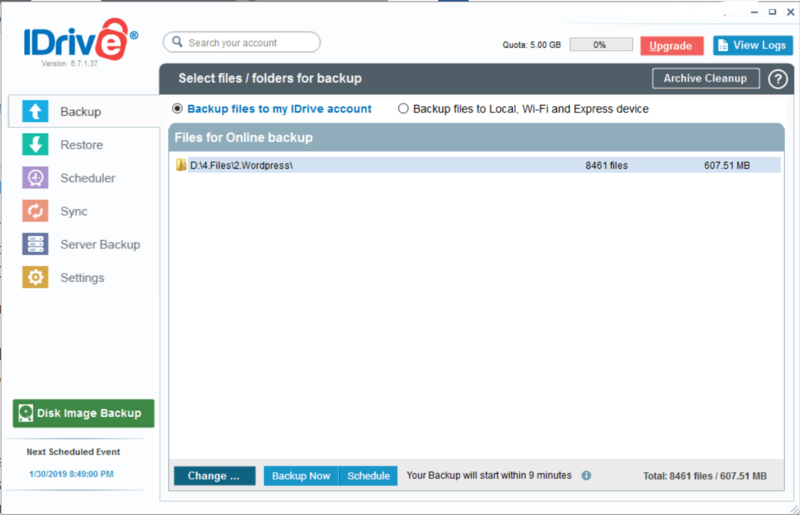 IDrive Express is a really nice perk of IDrive, as other backup solutions offer courier services only for recovery, not for initial backups. IDrive offers two features for photo-taking lovers. 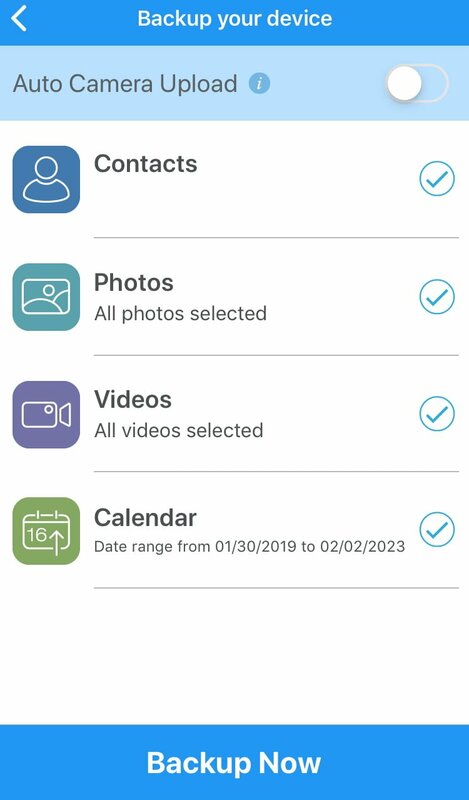 First, the Instagram and Facebook backup feature allows you to back up all of the photos and videos that you post on social media and the ones in which you were tagged. Second, the Recently-added IDrive People feature applies facial-recognition to your photos so you can easily categorize and tag them depending on who’s in the images. How many times have you accidentally deleted or modified a file just to feel extreme frustration afterward? Yup. Pretty sure it’s a big number. Well, IDrive addresses that issue by keeping up to 10 older versions of each altered or deleted file forever, which will surely come in handy if you’re trying to recover from a malware attack or get an old file that you deleted. 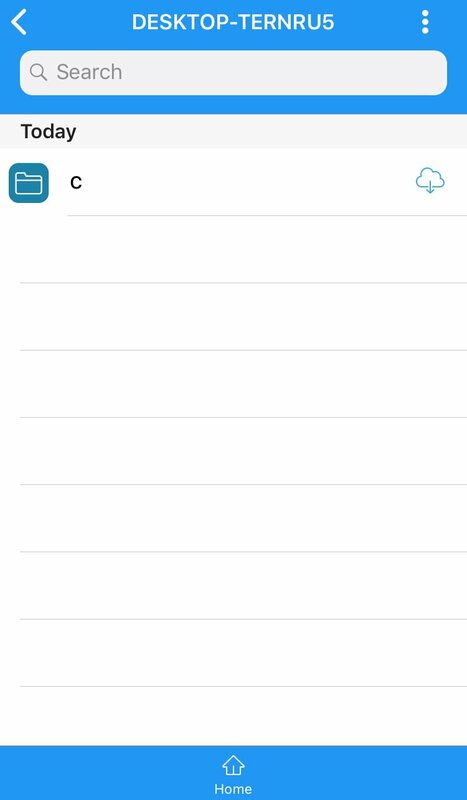 The feature is called “true archiving,” and the old files are included in your storage cap though, but the Archive Cleanup Tool from IDrive can help with managing that, and you can always delete them manually. 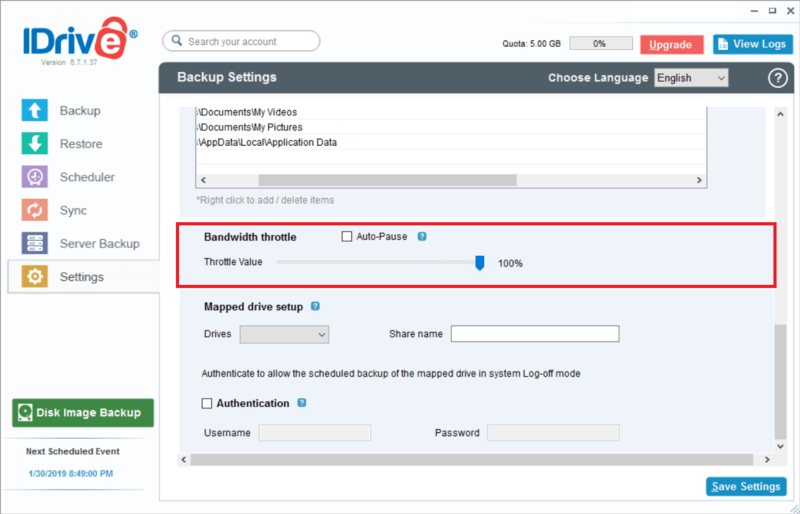 Other extra features that we really like in IDrive include the notification option, advanced scheduling capabilities, disk-image backup, and file versioning. 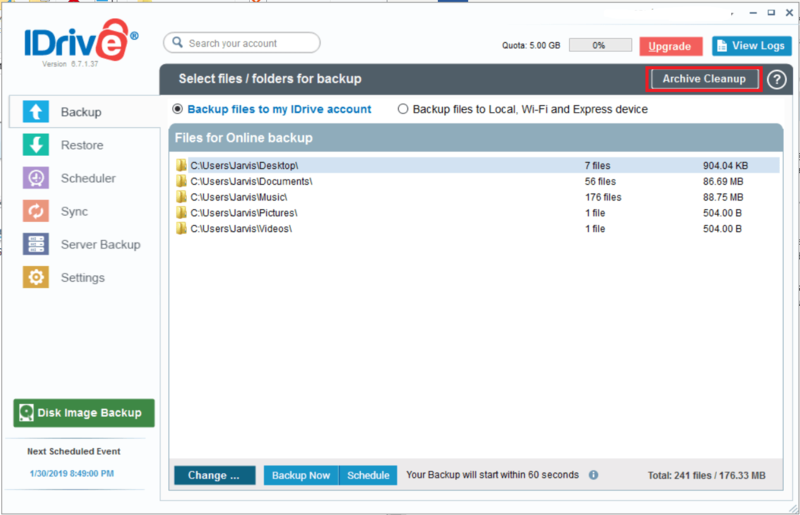 Although IDrive Express, which we mentioned earlier, would make your life a lot easier for an initial backup, some people would rather upload the files directly to the cloud for some reason or the other. So, how does IDrive compare to the rest of the Backup solutions out there when it comes to speed? For the test drive, we ran a speed test twice on a gaming PC running Windows 10. The set of files that we used included 607.51 MB of photos, documents, graphic design elements, and videos related to WordPress. We uploaded all that data to the cloud then restored all the files to the laptop. Both tests were done over a decent WiFi connection from our location, with a 10-Mbps upload speed and 50-Mbps download speed every time. Based on those numbers, the 600-MB files should take no more than 10 minutes to get to the cloud and around 2 minutes to download. The test results were pretty close to the estimations, as the files took 9 minutes to upload and 3 minutes to download during the first test, while the upload took 10 minutes and the download scored 2:40 during the second. Compared to other services in the same category, those numbers are pretty impressive, making IDrive easily the fastest backup solution available today. If you have a significant amount of data to safeguard, IDrive could theoretically do it in a short period of time, depending on the total size, of course. The difference between the tests can be attributed to the distance from the IDrive servers and the encryption process. A multi-threaded upload process would’ve been a nice touch from IDrive, but that’s a matter of personal preference. If you’re uploading a lot of data, and you don’t want the app interfering with your system resources, you can always limit the throttle value through the settings in the desktop client. The desktop user interface of IDrive offers a great balance between presentation and data, with a clean, compact dashboard through which you can access all the settings with ease, without feeling overwhelmed with options and buttons that you wouldn’t use anyway. The desktop client features a navigation menu on the left side, with five tabs in total: Backup, Restore, Scheduler, Sync, Server Backup, and settings. The backup tab presents the folders that you want to back up, with the defaults being the Desktop, Documents, Music, Pictures, and videos. As mentioned above, you can change the folders as you wish. Once you set your folders and files, you can either proceed to back up immediately or schedule the process for later. 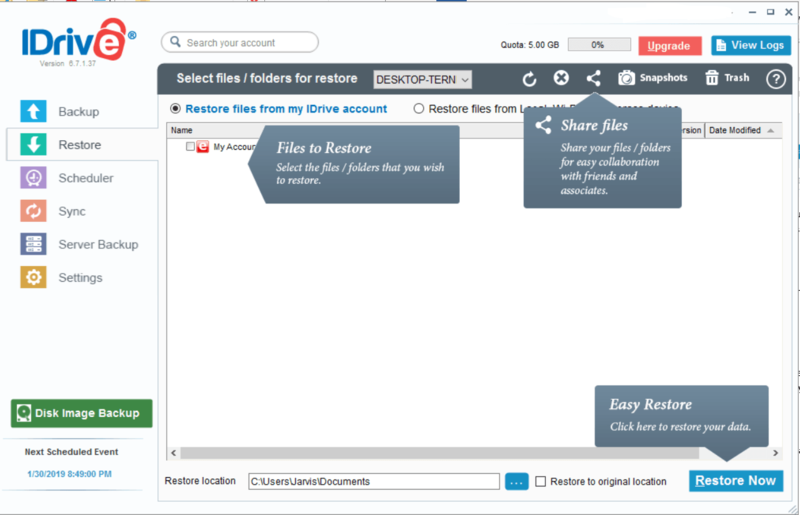 The restore tab gives you the option to either recover all your files and folders or just a few of them. 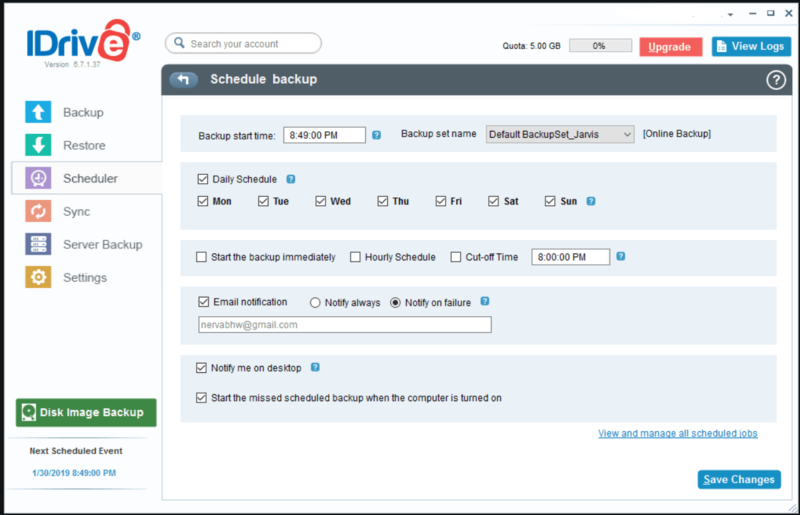 Through the Scheduler tab, you can set your settings for scheduled backups. 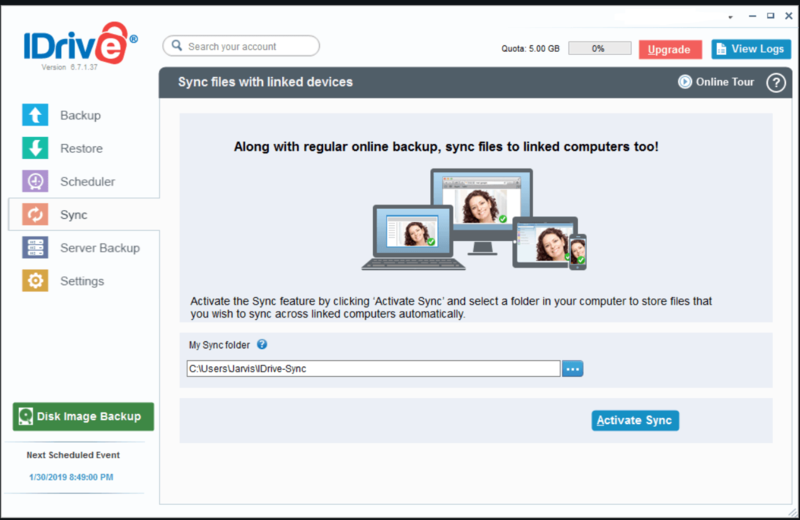 The sync tab lets you select the sync folder on your computer for the files to be synced through all of your linked devices. What’s impressive about this feature offered by IDrive is that the Sync online storage space can match the backup storage size at no extra charge. So, if you have 2 TB of storage space, you can get 2 TB of sync space as well, making IDrive quite the bargain considering that other services, such as Dropbox, would charge enormous amounts of money for just the fraction of the storage size. IDrive is one of the companies that take security and privacy seriously, as it takes all of the necessary steps to ensure that customer data is well-secure when stored on their servers. First, all the data is stored in secure servers that are maintained in hardened data centers across the United States. Not only are these facilities designed and optimized for fast data transfer, but they’re also well-secured thanks to 24/7 secured access, motion sensors, surveillance, and breach alarms that protect the place against trespassers. Furthermore, IDrive uses state-of-the-art technologies and features to make sure that the facilities can withstand natural disasters, which include HVAC climate control systems, fire-suppression systems, raised floors, cooling zones, and racks built to handle earthquakes. All the measures taken by IDrive make their facilities suitable to be war bases, not data centers. As for digital protection, IDrive employs in-transit and at-rest encryption, using the 256-bit AES encryption level for both, which is a protocol that’s known to be foolproof with no successful cracks in the past. As mentioned above, you can either let IDrive hold onto the encryption key to allow the company to reset your password if ever you forget it, or you can retain the key yourself to ensure that nobody can access your encrypted data. Keep in mind that if you want to opt for the private encryption, you need to do it when you first sign up, as there’s no option to change that once you start uploading. When choosing your password and encryption key, make sure to pick strong and different ones, as no matter how well-encrypted and protected your data is, there’s always a chance someone may obtain or steal your password. To get some extra peace of mind, you can enable email two-factor authentication from the security settings. Additionally, IDrive lets you disconnect synced device remotely, which means that in the unfortunate event of your phone or laptop getting stolen, you can quickly sign in to your account from another device to make sure no one can access your data through the stolen device. 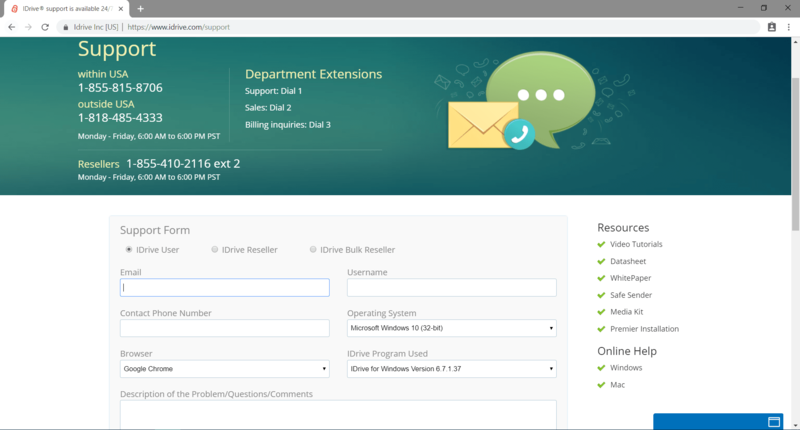 IDrive’s support team is one of the best out there, as the enormous online backup service offers 24/7 support, with two main communication channels; email and live chat. No matter when you need assistance, just fire up the live chat client, and you’ll get a support representative looking at your issue and answering your questions in a matter of minutes. At least that’s what we got when we tried contacting the support at 4 AM to ask about some issues that we “theoretically” had. Even though we asked some pretty obvious questions, the support representative was patient enough to address every issue we had. If you prefer using email, you can easily fill out a support form online that, thankfully, doesn’t send you to the FAQs page, which is an annoying practice that many websites do. IDrive offers a support phone number as well, but it can only be used on weekday business hours, which totally makes sense. We tried the phone support as well, and the representative was really nice and answered our questions thoroughly. If you’re the type of person who’d rather figure everything on their own, you can take a look at IDrive’s comprehensive knowledge base that contains a plethora of FAQs and tutorials. It’s time to address the big elephant in the room and answer the million dollar question; is IDrive well-worth the price? Taking a look at the different subscriptions, you’ll notice that IDrive offers a free plan, but it’s limited to 5 GB of data, which makes it on a par with online syncing solutions, such as Google Drive, which offers 10 GB of storage space for free. IDrive offers two paid plans as well. First, we have the IDrive Personal Plan, which gets you up to 2 TB of storage. IDrive lets you backup as many devices as you need, but limits the storage space, as opposed to other backup service providers, such as Backblaze, which give you unlimited storage space for a single device. IDrive personal costs $52.15 for the first year if you get a one-year plan (which renews at $69.5), and $104.25 if you get a 2-year subscription (which renews at $139). The company offers a 5 TB upgrade for the personal plan, which costs $74.62 for the first year (which renews at $99.5) or $149.25 if you opt for the 2-year subscription (which renews at $199.00). The second plan that IDrive offers is the Business plan, which includes several sub-plans to suit your needs. Basically, while the Personal plan is suitable for individuals as it offers unlimited computers for a single user, the Business plan is tailored to meet the needs of businesses (obviously), offering both unlimited computers and unlimited users. 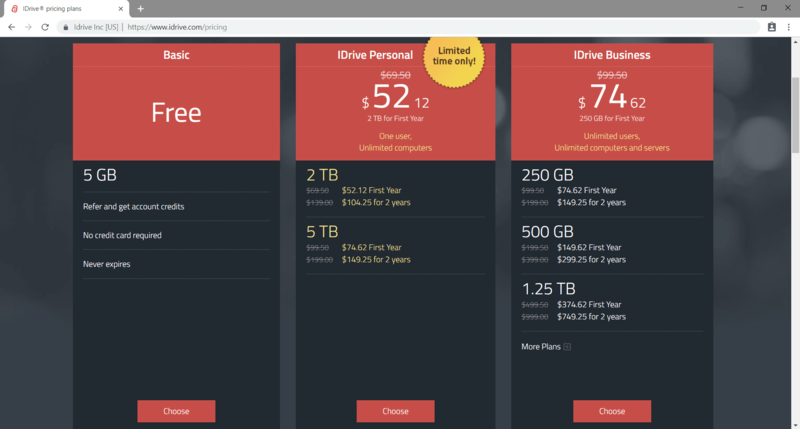 The fact that IDrive can be used across all major operating systems, Windows, MacOS, Linus, Android, and iOS, makes the proposed prices quite reasonable and competitive compared to other online backup services. Although IDrive isn’t suitable for people who dread managing their backups themselves or those with massive storage needs, it’s still quite the bargain and an option worth considering because of the affordable price and the impressive features that it boasts. 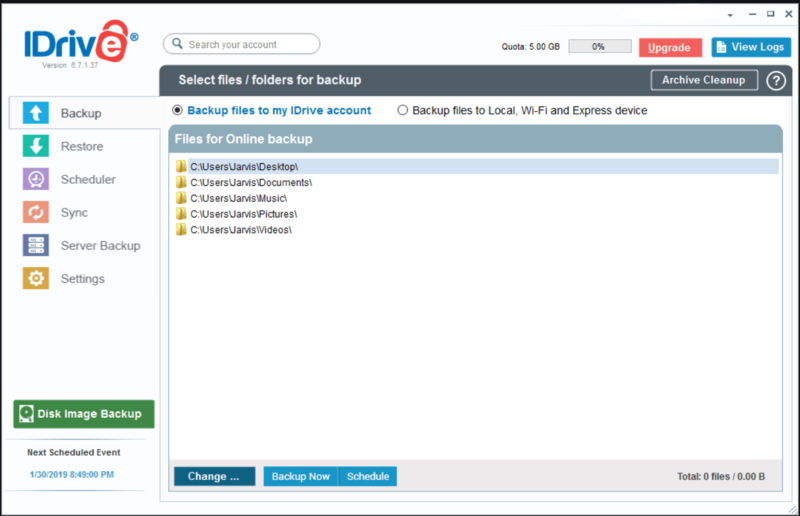 If we’re to take only the features into consideration, we’d undoubtedly give IDrive the title of the best online backup solution on the market. 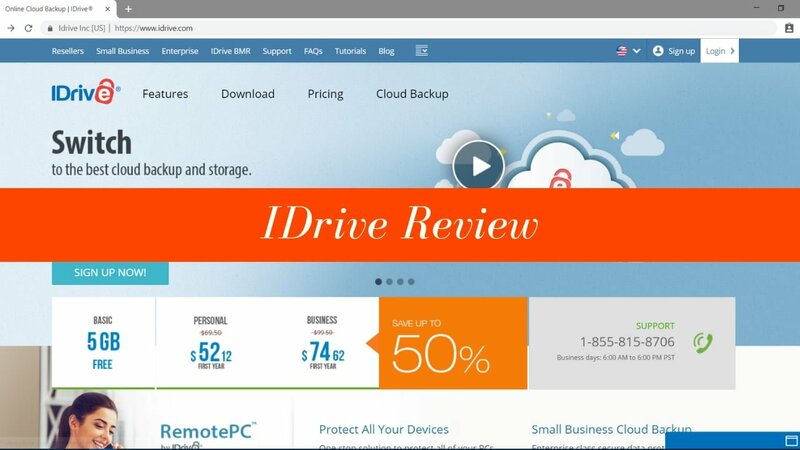 IDrive works as both a backup and an online syncing solution, which means that it can eliminate the need for more commonly-used apps and services, such as Google Drive and Dropbox. The 24/7 live chat, well-secured data centers, state of the art encryption, ease of use, fast upload and download speed, and convenient services such as the cross-platform syncing and the free IDrive Express courier service make IDrive an ideal choice for almost everyone. 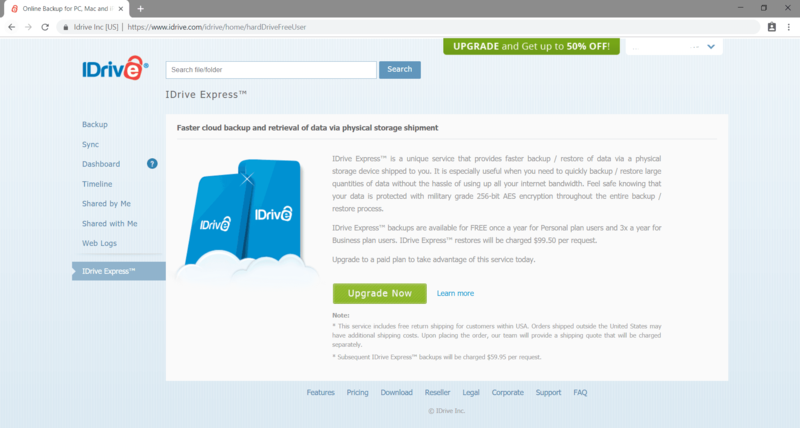 As a matter of fact, the IDrive express service alone is enough to be a selling point for anyone with a substantial amount of data to back up. So, our verdict is; as long as you can live with IDrive’s storage limits, you shouldn’t really think twice before signing up.